I’m participating in a super fun Blog Hop today to showcase Velvet Finishes paint! 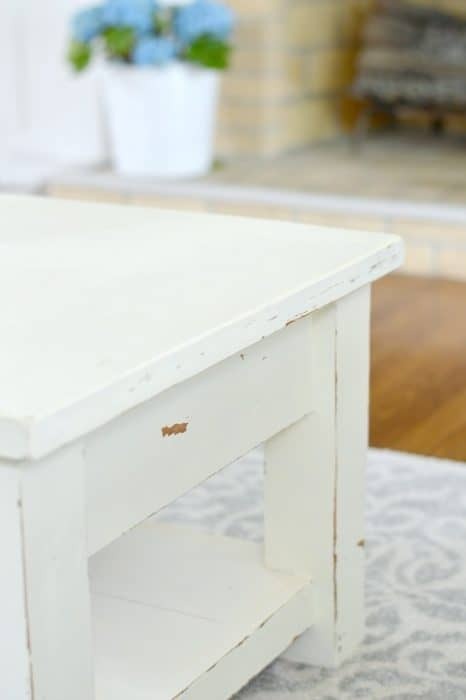 This paint line is my favorite product to demonstrate how easy it is to paint wood furniture! If you’ve been visiting these parts for any length of time you will know of my undying love for Velvet Finishes Paint – the no fuss, no prep, brushstroke free paint that I regularly rave about. I’ve used it to transform an old dresser, a rocking chair and even some IKEA nightstands. Rococo is a rich and elegant cream. It adds so much more warmth to my living room than plain white would. If you’re unfamiliar with VF, it’s really quite amazing. I didn’t prep my table in any way before hand. No sanding, no priming and best of all – richly pigmented coverage that leaves NO brushstrokes. I like to call VF the lazy painter’s best friend! You can see that I lightly sanded the edges and sides for a distressed look which I think complements the cream tone of the paint perfectly. Our living room was starting to feel weighed down by some of the darker colors I’ve chosen. 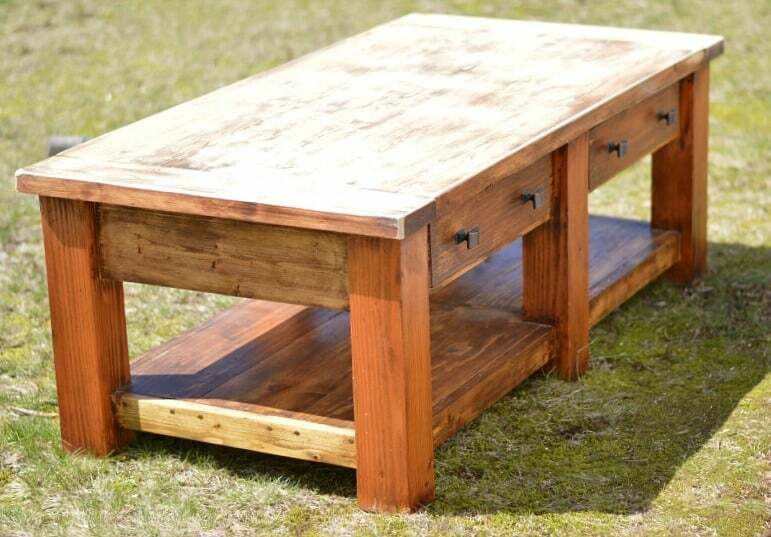 This rustic coffee table really helps to brighten the space up and bring all the other elements together. If you want a full tutorial on how to apply Velvet Finishes paint I highly recommend checking out my most popular VF post here and for more info on the other products in the VF Line (a deglosser + protector) see this post. 5 other talented bloggers have also participated in today’s Makeover Madness Blog Hop. You’re going to love each piece that they chose to paint with Velvet Finishes! How to save the dresser…..any ideas?? Could you replace the top with some new wood? It should be easy enough to get a nice piece cut to size at Lowe’s or Home Depot! Beautiful job on your coffee table! Quick question…if you don’t mind…where is your couch from and what color is the fabric? I am currently in search of the perfect sectional. Love your makeover! It looks perfect in your living room! Rococo is one of my favorites! I love the way your coffee table turned out, so pretty! Such a pretty makeover! I’m a sucker for white and distressed and you did it beautifully! I love how much the new paint brightens the room. That coffee table is beautiful. Great job, Jenna! 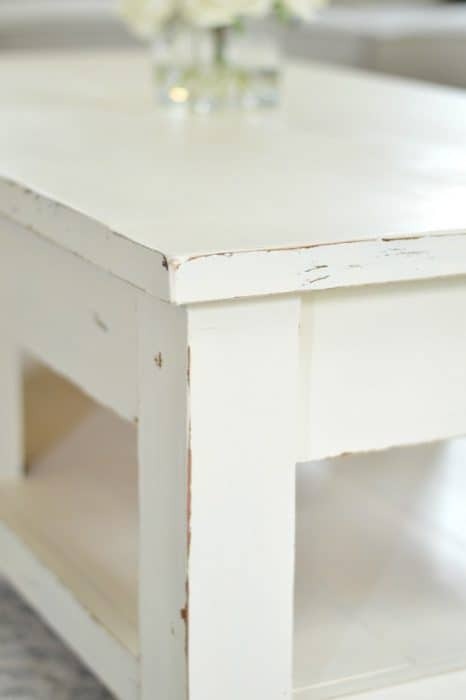 I love how you distressed the table – the finished product looks wonderful! Nice work! Jenna, I love your coffee table transformation. You really updated the piece and gave it a new life. Great job.